We have on offer many variants from the collection of Anti Corrosive / Anti Oxidation sprays like the anti corrosion spray, zinc anti corrosion spray, industrial anti corrosion spray, etc., that come utilized in providing defense against long-term rust and corrosion of all metals. We sell at very reasonable prices and make use of the best in terms of R&D. We are the eminent manufacturer and supplier of a wide range Zinc Alu Spray that is highly demanded in every commercial and noncommercial sector. These Sprays are manufactured using a high grade of raw material that is procured from our reliable and trusted vendors. Resistant to many chemicals, salt, water with temperatures withstanding capacity of up to 500°C. We import Stainless Steel Spray from FAREN Chemical Industries, Italy. Spray Fill India Pvt. Ltd. is ISO 9001 Certified Company. Stainless Steel Spray has marked anti-corrosive properties, and it resists major oxidizing agents such as acids, alkalis, salt mist etc. It provides protection against atmospheric or corrosive agents or high temperatures. Stainless Steel Spray is used in various metal grades such as 304L, 316L, etc..
We provide a wide assortment of Stainless Steel Spray that is manufactured by using the qualitative raw material. These raw materials are procured from trusted industries. These Sprays are available in different specifications. We provide these Sprays as per the need of clients at competitive prices. We import Zinc Metal Spray from FAREN Chemical Industries, Italy. Spray Fill India Pvt. Ltd. is ISO 9001 Certified Company. Zinc Metal Spray offered by us is manufactured with the high-quality raw material. We offered Zinc Metal Spray in different capacity packs. Zinc Metal Spray offered by us passes ASTM Standards evaluation after exposure. Zinc Metal Spray which we offer gives guarantees protection against corrosion and oxidation for a long period of time, even in open air. Its light-colored tint is very similar to that produced by hot-dip galvanization. We are the prominent manufacturer and supplier of Metal Spray that are designed in different capacities and are manufactured using high-quality raw material. These are widely demanded in several commercial and noncommercial areas. These are supplied various parts of the country. We are the leading manufacturer and trader of an eminent range of Copper Metal Spray that is available in several specifications. We do quality checking of these Copper Metal Spray before supplying towards client’s end. These Copper Metal Sprays are used for the commercial and industrial purpose. We are engaged in manufacturing and supplying premium quality Brass Spray that is manufactured using the best quality raw material. We offer these Sprays in various specifications. We offer these Brass Sprays at reasonable prices with excellent durability. We are engaged in manufacturing and supplying Aluminum Spray that are designed in order to fulfill the demand of several industries for various metallic and nonmetallic bodies. These are available in various specifications. We trade these Aluminum Sprays in various parts of the Indian subcontinents at competitive market prices. We offer an exotic range of Aluminum Spray A-200 High Brilliance Grade that is manufactured with high-quality raw materials with certain standards. These are available in various industrial specifications and are widely demanded due to salient features like corrosion resistant, easy to use and nontoxic. 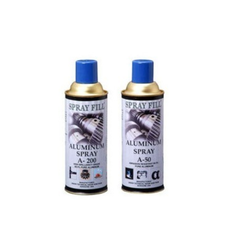 These Aluminum Sprays are offered at reasonable prices. We offer an engineered range of Aluminum Spray A-50 Abrasion Resistant that is designed with high-quality raw material that provides excellent cleaning. These are available in various ranges and are widely demanded due to attractive & long-lasting quality. These Aluminum Sprays are offered in various packs and designs. Used as a preventive coating against corrosion of the surface of various metals. The coating has high-temperature resistance and also allows exposure to 800°C for short period. Helps in resisting nearly all diluted acids as well as weathering. We import Cold Galvanizing Spray from FAREN Chemical Industries, Italy. Spray Fill India Pvt. Ltd. is ISO 9001: 2008 Certified Company. We are one of the leading formulator and importer of Cold Galvanizing Spray that offers the convenience of on the job aerosol application and also protects hot-dip galvanizing.